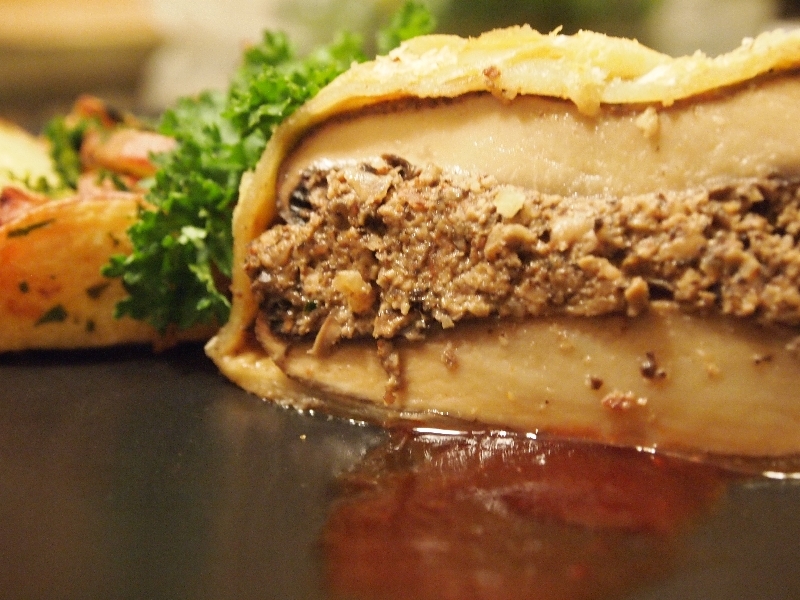 Mushroom Wellingtons with Red Wine Reduction. This recipe is a delicious take on beef wellingtons and mushrooms, pecans, and yeast extract pack the dish with flavor and protein. Many of the premade puff pastry doughs you can buy in the store are vegan, but they are full of rehydrognated oils and corn syrup which are terrible for you. If you have time you can make your own or treat yourself to something that contains butter. Heat one tablespoon of olive oil in a large skillet over medium heat. Saute the three mushrooms cap up covered in the pan for about 2 minutes. Flip the mushrooms and continue cooking until just tender to the touch. remove the mushrooms from the pan and add the remaining olive oil to the pan. Saute the onions, garlic, pecans, and sage until fragrant, about 2 minutes. Transfer the saute to a blender of food processor. Add one of the mushrooms and yeast extract and blend, adding stock as needed, until a thick puree forms. Season with salt and pepper to taste. Stuff the remaining mushroom halves with the puree and put the two stuffed caps together to create a single semi-spherical stuffed mushroom. Stack the sheets and place the mushroom in the center of the pastry sheets. Wrap the puff pastry around the mushrooms and spray the wellington generously with cooking spray. Place the wellington in the oven at 400 degrees Fahrenheit until the puff pastry is golden brown, for about 20 minutes. Slice and serve with Red Wine Reduction Sauce.